Nityananda Prabhu’s father’s name was Sri Hadai Ojha, and His mother’s name was Padmavati. After Nityananda Prabhu, Padmavati gave birth to another son, whom they called Banka Raya. The two brothers, Nityananda and Banka Raya, took birth in the village of Ekacakra. Close to that village flows the Yamuna-nadi River. In Their boyhood days, Nityananda and Banka Raya played with Their friends on the bank of the river and performed various lilas there, krishna-lila and rama-lila. Banka means curved in three places, tri-bhangi. So Banka refers to Krshna, Raya to Radharani and when both are combined They are Banka Raya, Gauranga. Krshna and Radha combined is Gauranga. That is the meaning of Banka Raya. The two brothers went to the village called Mayuresvara, which was the village of Their maternal grand-father. Close to the village there was a jungle. Once, when these two brothers were about to enter that jungle, two villagers debarred Them, “Hey, don’t go to that jungle. There is a very big poisonous snake that devours everyone who goes there. No one returns. Please don’t go.” Nityananda Prabhu did not listen to them and They both entered that jungle. That big poisonous snake was staying under a tamala tree, and as soon as these two brothers entered the jungle it came out, raising his hood and hissing. Nityananda Prabhu was not afraid at all, rather He raised His hand and said, “Eh! Oh, wicked fellow! Dunta, stay there! Stay there! Don’t come forward!” The snake stopped. “Why are you killing and devouring innocent people?” Nityananda Prabhu is Nagaraja, the king of all snakes, Anantadev Naga, so when He told the snake to stop, he stopped. Then He continued and asked, “Why are you doing this?” Then the snake related his history from Dvapara-yuga. The big snake said, “In Dvapara-yuga, after staying in the house of lac, the Panca Pandavas were wandering in disguise as brahmanas, begging alms from village to village. They met Vyasadeva in this Ekacakra village and Vyasadeva told them to stay in the house of one brahmana named Vedasrava. Although, that brahmana was very poor, and would everyday go out to beg for alms, he spared half of his house for the Pandavas to live with their mother Kunti. Everyday four of the five brothers would go out begging for alms, and one brother would remain with Kuntidevi. In this way they would take turns. The demon became very happy, “Yes, very good! Why shall I come if you send food every day?’ So they would take turns; today is your turn, the next day his turn, and the day after it was the turn of someone else. In this way, every householder had a turn. It was a very big village, as some villages were clustered together and each householder’s turn would come once in every thirty-three years, two months, and twenty days. The village was that big, with so many people. So that day it was the turn of the brahmana Vedasrava. The day before a drummer, while beating his drum, had proclaimed, “Tomorrow it will be Vedasrava’s turn.” There were only four persons in the poor brahmana’s family: Vedasrava the brahmana, his wife Umadevi, a ten year old son Vidyadhara, and their eight years old daughter, Bhanumati. They arranged two buffaloes, one cart with a load of anna, rice, and pitha, cake. Then the question arose, “Who will go to bring the food to Bakasura?” Vedasrava said: “I will go.” Then his son, the ten year old boy, said, “No, no, father, you don’t go, I will go.” When the son said that, the brahmani started crying. So when Kuntidevi ran there and asked why she was crying, the brahmani told her all this. Bhima became very happy, “Yes, I will go!” So Bhima left with that cartload of anna, rice and cake. While eating the anna and cake he was shouting, “Hey, demon Bakasura where are you? Come out! Come out!” The demon came out and saw that someone was eating his food. He became angry and uprooted a big tree and threw it at Bhima. Bhima did the same; he also uprooted a big tree and threw it at the demon. There was a fierce battle between them. At the end Bhima killed that demon, ate everything, and returned with an empty cart. “So from that day on, I am here. Whoever comes here I’m devouring.” That cobra related this story to Nityananda Prabhu. While saying this Nityananda Prabhu took one of His golden earrings out of His ear, and put it on the mouth of the hole. From that day Nityananda Prabhu or Balarama or Baladeva has only one kundala, earring, eka kundala, not two. That kundala has gradually turned into a big block of stone, and a very nice temple is built over it. It is a holy place now, known as kundali-tala, or kundali damana and many people are going there to offer worship and bhoga to that cobra, naga. These are some of the childhood pastimes of Nityananda Prabhu and there are so many more. There is also one pastime of Banka Raya, of which I will give you a summary. Once, Banka Raya was overseeing the cultivation of some land. It was a big property of about five or ten hectares of cultivated land, with many weeds. Some labourers were engaged in pulling out the weeds. Around midday Banka Raya said to them, “Alright, you must be hungry now, go home, eat, take some rest and then come back to finish the work.” After all the labourers had left for their houses, Banka Raya Himself uprooted all the weeds of the whole five hectares within one hour, something that these 50 waged labourers couldn’t have done. When the labourers saw these wonderful activities of Banka Raya, they went to Banka Raya’s father and said, “Pandita Ajna, your younger son Banka Raya told us to go back home, and take food and then He Himself pulled out all the weeds within one hour; it’s so wonderful. All the weeds are still there in several big mounds. Upon hearing this, all the villagers went to see this wonderful activity. His father and mother Padmavati also went, but they couldn’t see Him anywhere; Banka Raya had disappeared. When His mother and the villagers started crying, they heard an aerial voice, “You cannot see me any longer, but this coming Ekadasi, you’ll find Me floating on the Yamuna River in the form of a log of wood. Pick that log up and worship Me.” So that is what happened; on that Ekadasi day at that place, which is now known as Kadamba-khandi, some villagers saw a log of wood floating on the Yamuna River. 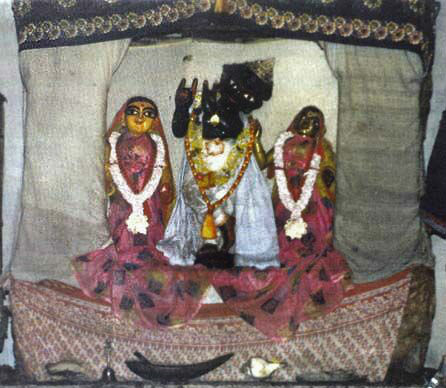 Nityananda Prabhu Himself lifted that log of wood up and carved a murti of Bankabihari, Krshna. Nityananda Prabhu named the murti Bankim Deva, and He installed that murti. Now there is a temple for that vigraha and on every Nityananda trayodasi day, the Appearance Day of Nityananda Prabhu, a big fair is held in front of that temple. It is said that when Nityananda Prabhu disappeared, He entered into that vigraha. These are only some of the pastimes, but there are many more.